Parkinson’s disease was first described by a British doctor more than 200 years ago. The exact causes of this neurodegenerative disease are still unknown. In a study recently published in eLife, a team of researchers led by Prof. Henning Stahlberg from the Biozentrum of the University of Basel has now questioned the previous understanding of this disease. The arms and legs tremble incessantly, the muscles become weaker and the movements slower − these are typical symptoms that many Parkinson’s patients suffer from. More than six million people are affected worldwide. In these patients, the dopamine-producing nerve cells in the brain slowly die off. The resulting lack of this neurotransmitter impairs motor function and often also affects the cognitive abilities. So far, it was assumed that the protein alpha-synuclein is one of the trigger factors. This protein can clump together and form small needles, so-called fibrils, which accumulate and deposit as Lewy bodies in the nerve cells. These toxic fibrils damage the affected brain cells. A team of scientists led by Prof. Henning Stahlberg from the Biozentrum of the University of Basel, in collaboration with researchers from Hoffmann-La Roche Ltd. and the ETH Zurich, have now artificially generated an alpha-synuclein fibril in the test tube. They have been able to visualize for the first time its three-dimensional structure with atomic resolution. “Contrary to our expectations, the results seem to raise more questions than they can hope to answer,” says Stahlberg. It is important to know that in some congenital forms of Parkinson’s disease, affected persons carry genetic defects in the alpha-synuclein gene. 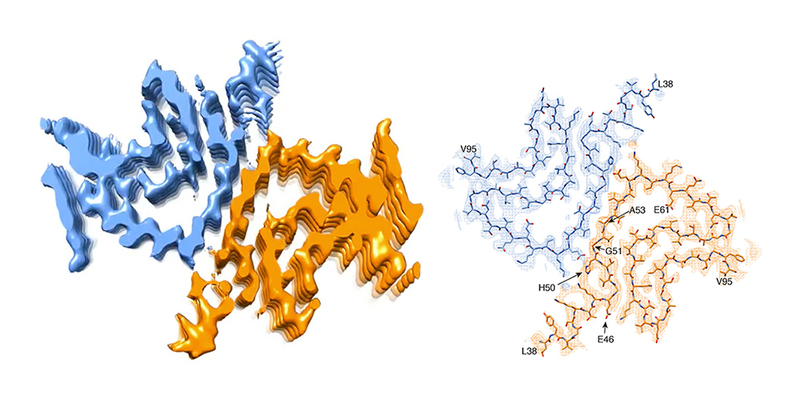 These mutations, it is suspected, eventually cause the protein to fold incorrectly, thus forming dangerous fibrils. “However, our 3D structure reveals that a mutated alpha-synuclein protein should not be able to form these type of fibrils,” says Stahlberg. “Because of their location, most of these mutations would rather hinder the formation of the fibril structure that we have found.” In brief, if the fibril structure causes Parkinson’s disease, the genetic defect would have to protect against the disease. But this is not the case. So, it could be possible that a different type of fibril or another form of the protein triggers the disease in these patients.